The idea of this section is to share my experiences in finding compatible equipment to make recordings from the flute. This was surprisingly difficult to find out on the web and so I hope this section will make it easy for you. I have also included photos of my flutes and other instruments. This is the microphone itself which has an adjustable clip to on fit on different size instruments. The microphone position can also be adjusted to minimise blowing noise etc. The other end of the microphone has a mini USB cable (4 pin) that fits directly into a phantom power adapter (standard size, 3 pin, shown in the picture), which comes with the microphone. 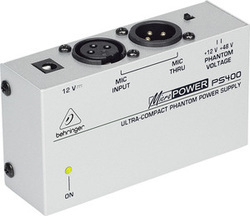 The phantom power itself, used to power the microphone, is not included but can be purchased separately (see below). This is the power supply for the flute microphone. The phantom power adapter (above) plugs directly into the female XLR port shown in the picture. A separate XLR cable (standard size, 3 pin, male and female ends) is needed to plug into the back (microphone port) of the Lexicon Alpha Desktop Recording Studio (below). There is a switch on the power supply (shown in the picture) that needs to be switched to 48 V (not 12 V). The power supply then connects to the mains. This is the interface between the flute microphone (via the phantom power box above, see above) to the USB port of a computer. A second channel can be added (via the instrument port on the front) to record a second instrument simultaneously with the Lexicon Alpha, although I do not use this. Headphones can be added via a port on the front (see picture). Other settings control input recording level, output volume level, mix balance and mono/stereo selections. A supplied USB cable connects from the back on the Lexicon Alpha (mini USB port) to the PC (standard USB port). This is the software that comes free with the Lexicon Alpha above. 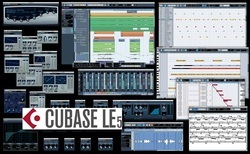 It enables tracks to be recorded, mixed and then saved in a variety of formats, e.g., .mp3 files. The software is a light (LE) version, but has all the essential functions that you might expect. A trial version is initially loaded, but then you have to register (via email, for free) for the full LE 5 version. Other software works with the Lexicon Alpha, although I haven't tried this. This software is not necessary for flute recording, but I use it for composition. There are a number of packages available, but Version 7 includes good quality recordings of instrument sounds that can be played back to hear your score in a near-realistic way. I use the output in my recordings as backing tracks.